We are living proof that: “Information alone does not change people but inspiration will”. Our focus is to provide a safe and relaxed atmosphere for riders so they will discover and expand their abilities with their horse. Open hours enable owners to ride according to their personal schedules. We encourage participation in horse shows but we are not a “show” barn. Instead, our entire focus revolves around you and your horse. Whether your horse is near or at retirement who would enjoy our 6 miles of riding trails or a young gelding who would enjoy the challenges of our riding arena, you will find that Jubilee Stables has it all. With that focus in mind, we maintain open hours to enable riders to ride according to their personal schedules. We are also proud to offer customized horse care to any circumstances, including personalized feeding schedules and supplements. 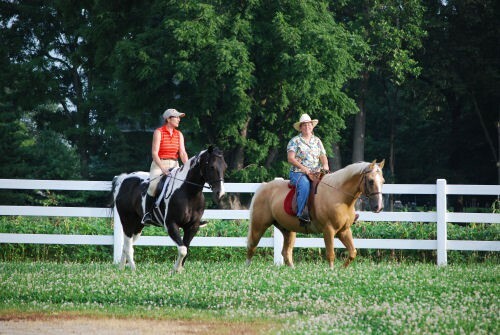 We offer horse boarding to Tippecanoe County residents and beyond, including Lafayette and West Lafayette, Indiana. Operating and managing Jubilee Horse Stables is our passion. Since 1981, we have offered our farm as a boarding stable. From that original 3-horse stall barn, by 1997, we had expanded to a 12-horse full service facility. During that same 16 year period, we also added our ‘Annex” facility where we could provide stall and/or pastures for 18 horses. After operating two separate facilities for 16 years and usually 30 horses, we sold our original site in 2013. The “Annex” facility is Sharon’s birthplace with family history since 1902. For years it was a dairy farm with 70 milking cows. The dairy was dispersed in 1977. There are two distinctive concrete silos because of the dairy. We formed an LLC in 1990 and began converting the family farm from cows to horse stalls and barns. This facility has always been our budget site because we offer a $50 discount to boarders for cleaning their own stall(s). That discount is the premise for our operation today. No one knows more than we do as horse owners that owning a horse is a discretionary expense. We strive to operate efficiently so our boarders can afford their horses and continue to enjoy their horse. "The Senior Equine presents a challenge to any caregiver. They require customized diet, special farrier needs and closely monitored health care. Jubilee Stable owners have years of experience in the horse industry. They continue to seek educational opportunities for themselves and the boarders providing clinics and speakers. The stable is clean, well organized and well equipped to meet the needs of each individual boarder. The horses have ample room and fresh water always close by. Jubilee Stables’ longstanding relationship with Purdue Veterinarians gives the boarder peace of mind for emergency care and the latest preventative measures. "As a horse owner, it can be very stressful selecting a home for your horse. There are so many questions that you ask yourself when visiting prospective farms: Will they put the care of the horses first? Will they keep the farm clean and safe? Will they notice if there is something wrong with my horse? Are they organized? Will my horse receive the high quality of care that I would give him myself? At Jubilee, all of these questions and concerns have been met and they apply the knowledge and the skills that they have acquired over the years to the care of their farm and the horses who reside there. Sherri and Sharon are wonderful women who are extremely easy to talk to and truly listen when a boarder has any concerns. I always felt confident knowing that my horse was receiving the best quality care. At Jubilee, you will not be nickel and dimed for the little things and your horse will always receive good, honest and loving care.